In a two-qt sauce pan, bring one qt of water to a rolling boil. 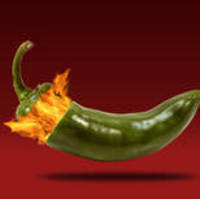 While it is reaching a boil, Cut a long flap in each jalapeno, starting from the shoulder and running close to the tip; this should be an elongated "V"
shaped flap. Lift the flap and clean out the fibers and seeds (this is where most of the heat is); I use either a round-tipped peeling device or possibly a tsp.. 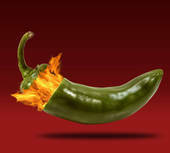 When water reaches boiling point, immerse cleaned peppers in the water and reduce heat to medium. Let peppers parboil for about 10 min.... better which they be a little undercooked then overcooked. Mix the rest of the ingredients together, turning and blending till the cream cheese is well mixed into the rest of the ingredients. If the mix seems too dry, add in a little lowfat sour cream, pickle juice, vinegar, anything in the fridge you think might add in a touch of individuality. Remove peppers, dump into a strainer, and run cool water over them. Lift the flap of each pepper and stuff the cheese mix into the pocket; fold the flap back down over the stuffing. A little overstuffing is OK.
Place the peppers on a sprayed pan and bake at 400 degrees for about 10 0 15 min; just till the cheese begins to heat out of the peppers. Remove and let cold for about 4 - 5 so the cheese sets up a little. Serve with a few crackers or possibly tortilla chips. Parboiling the peppers removes a substantial portion of the raw heat, but leaves sufficient to give a nice burn to the mouth. I fixed this as an appetizer for Doris and I tonight. They serve 2 - 3 people, depending on how soon dinner is to be served! Left over filling can be saved for several days for another batch or possibly to eat on crackers, in celery, on (when no one is looking) by the forkful! NOTES :This recipe is my own creation.... tested, tasted, tested, tasted, etc. and true. Sounds wonderful,can't wait to try them with my own stuffing !!! Wow! I made stuffed jalapenos wrapped in bacon, this afternoon. It is a weekly ritual, where I work, to have this. So I did it at home for the first time. I will parboil my peppers next time. I used Neufchatel and stirred in cilantro and one minced clove of garlic! YUMMY! I'm checking out your recipes and, while I've been making preserves all day, (and tasting lol) I'm still getting awfully hungry! This recipe sounds delicious. I would definitely serve mine with a cooling sauce on the side for the spicy challenged,like a Sweet Chili Sauce or a Cucumber Ranch!! Thanks for sharing!! This recipe was a BIG hit at a recent party! Everybody wants the recipe. Oh, I used bacon.